If you’re serious about maintaining healthy cholesterol levels already within normal range, Cholest Wise can help! Cholest Wise is an innovative supplement that also works to promote cardiovascular and circulatory wellness. Contains several beneficial ingredients: Flush Free Niacin, Garlic, Fish Oil with Omega-3 Fatty Acids, Policosanol, Plant Sterols, and Pantethine. †Foods and dietary supplements containing at least 0.5 g per serving of phytosterols (plant sterols, plant stanols, or plant sterols and stanols, expressed as unesterified form equivalent) eaten with meals or snacks for a daily total intake of 2 g as part of a diet low in saturated fat and cholesterol may reduce the risk of coronary heart disease through the intermediate link of blood total and LDL cholesterol. 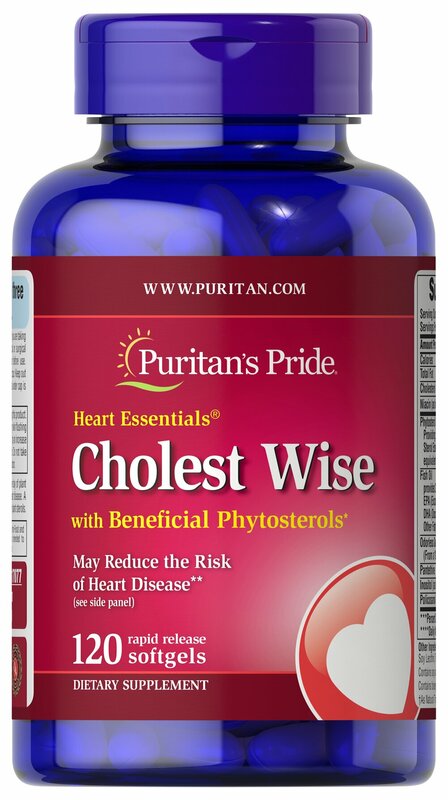 A serving of Heart Essentials™ Cholest Wise provides 600mg of phytosterols [plant sterols, plant stanols, or plant sterols and stanols, expressed as unesterified form equivalent]. Phytosterols are found in unrefined vegetable, nut, and olive oil; nuts, seeds, whole grains and legumes are also premium sources of phytosterols [Raju, 2013]. No Artificial Flavor or Sweetener, No Sugar, No Starch, No Milk, No Lactose, No Gluten, No Wheat, No Yeast, No Shellfish, Sodium Free.